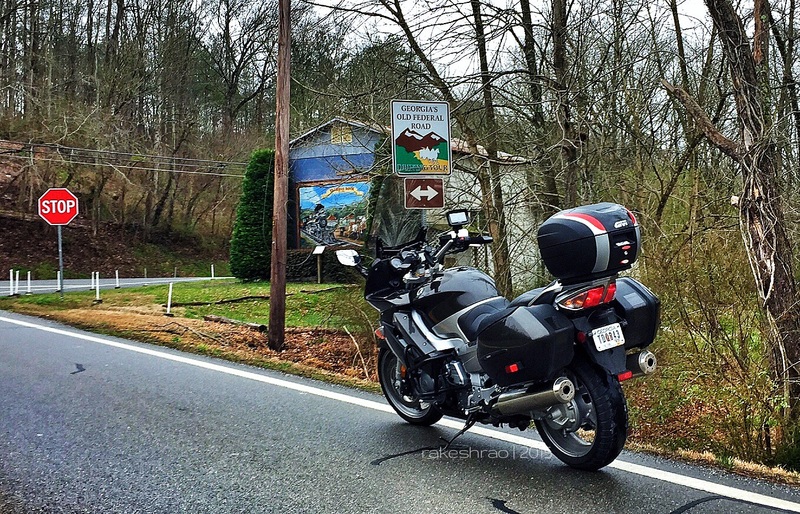 TheGrand Tour of Georgia (GTGA) was open to riding as of March 14, 2015. I had decided to ‘capture’ three of the locations. All towards the North/NorthWest of my home location. One of them is a mandatory, required location. All through the week the weather forecast showed light to moderate rain in the morning, drying out in the afternoon with temperatures ranging from 53°F to 71°F. Not cold for riding but certainly wet. I saw this as a good opportunity to ride and test out the ATGATT’s rain worthiness. When buying my apparel, I had focused on spending on ‘all-weather’ gear. At this time, I don’t want to have to spend on multiple outfits to suit each season. So far, the ATGATT has worked well in the warm summer and dry cold days. So, a test ride out in the rain was on the cards and the forecast presented a perfect morning for it. Blame it on a slow Saturday morning or long Friday night. I ended up riding off much later than I had planned. And with my return time not being that much flexible, I decided to knock one of the locations off the list for the day’s ride. It was the furthest and quite a fair bit of it was on the highway. On a clearer dry day I’d take an alternative winding route, but not on this gray, wet morning. This would now mean that I’d have to do another ride in that direction and more than the distance I covered in completing the two stops. After a Fuel stop on Hwy9, I used one of my regular routes heading towards Blue Ridge. Up SR372 through the town of Ballground, GA and joining up with 5/515 towards Blue Ridge. Approximately half way up the 5, take a right on to Antioch Church Road and another right onto SR136 which makes a kind of a Horse Shoe turn into Talking Rock across the Rail track. The Caboose on the left and the Main Street stores on the right. I’ve been to Blue Ridge a number of times; by car as well as on the FJR. Each time the signpost for Talking Rock would catch my attention. What was Talking Rock? Why was it named so? Could it be an interesting place to visit? Exploring needs time. Most explorers of yesteryear had an abundance of this precious commodity as a consequence Peoples, Riches and Lands were found. For better or worse, perhaps, would be open to question! Talking Rock was one of Bonus Locations for the GTGA-2015 which gave me the opportunity to explore and area/town I had not ventured to explore earlier. This is one of the biggest advantages of the GTGA. Riders get to go to places and locations which, otherwise, may not be visited at all. Talking Rock was incorporated in 1883, nestled in the mountains, Talking Rock lies between Ellijay and Jasper in Pickens County and lies along SR136, just off Hwy5/515. It is the third smallest town in the state and has not changed much since its beginning in 1883, when the train built up the town’s economy. Current population of 64! The origin of the town’s name is unclear, and people tell many stories about its derivation. Some say that the name comes from the noise of the water rolling over the rocks in the town’s creek. Others believe the name nods to the fact that townsfolk will sit on the rocks to talk with their neighbors. Still others believe that the name originated with the local Indians. (From: Talking Rock, Georgia) It is obvious that the town is pretty small. Kind of those towns, if they were on a straight road, you can miss if you blinked. A typical ‘Rail Road’ town. The main street developed just by the side of the Railroad station. The few buildings that remain, look as if unchanged from 1883 and house antique stores. The Talking Rock Caboose ‘housed’ on the Railway track is perfectly situated to allow for bikes to get right up close. Rail cars behind the Caboose are closed and seem to be used as a ‘store room’ – probably for the annual October Heritage Festival. Bonus captured and a few other pictures taken and onwards to the next Bonus Location – Blue Ridge Scenic Railway. Back out on the 5/515 and head north to Blue Ridge. 515 is all slab and bit of a dull ride normally. But today was different. With low clouds, light rain and a little misty along the higher elevation sections the ride was pleasant and strangely quite fun. With the wet roads and light rain, I kept the speed on the lower side – around 60/65mph. 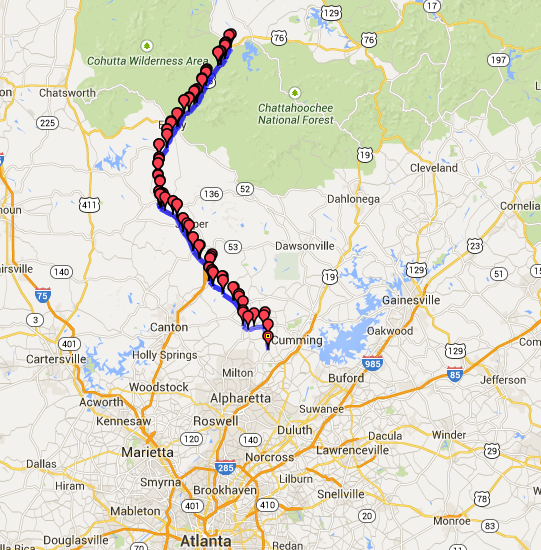 After Ellijay, 515 becomes the 76 as it meanders through the Chattahoochee National Forest. Take a right on the Old Highway 76, which leads on to E 1st St. Left and drop down to W Main St, double back onto Roberts Way. Park the bike and a quick walk to capture the location. Around this time, I was getting a little hungry. Next stop was Home. I didn’t want to stop in Blue Ridge to eat, even though there are a few excellent places to eat. Even for the a bad weather day, the Main Street was packed. More cars than motorcycles, but packed. A pub had a St Patrick’s Day party in full swing in its full green hat regalia, literally spilling over into the street. I decided to head back home and if really famished, I could stop along the way somewhere. The ride back down had intermittent moderate/heavy rain accompanying me. The bike handled well. Just like it should. I stopped along the way for some photos and then decided to just head on home without looking at stopping anywhere. Retraced the route I took on my way out and home at around 3pm to a dry warm afternoon. Gloves: I had windproof gloves which did a fine job. Those coupled with FreezeOut inner gloves and FJR’s heated Grips worked just fine in keeping the hands warm and dry. However, under heavier rain conditions I definitely would need a waterproof, insulated pair of gloves. Pants: I have a pair of Aerostich AD1 Pants. They do an excellent job in wind protection and keep the me dry. However, all the water that hits the jacket and the tank then rolls down to the crotch area and into the non-waterproof zipper. This makes for uncomfortable manhoods! I am told that the zipper can be upgraded at Aerostich for an additional $100 fee. I would have thought that the waterproof zipper would be standard. What good a waterproof pant with such a big leakage area? Windscreen and Helmet Visor: The rain highlighted these two items’ function in the rain very nicely. The rain water on the windscreen the helmet visor hampered the visibility considerably. A water repellant treatment has to be found which would effectively evacuate the water from the screen and Visor making for a clear view and visibility. More on this at a later date. All in all a good ride. Can’t wait for the next ride out. Nice. I ride in Dallas area with my indian motorcycle group. I see you changed the seat. Is it corbin? I am also looking to change my stock seat. The previous owner had replaced stock seat with this Corbin. It’s a decent seat. Personally, I find it a bit hard and I’ve made this observation in previous blog updates. Currently people rave about the Laam Seat but the wait time is considerable. I would suggest you actually try and test different seats on other FJRs before investing in a new one simply on recommendations. I saw pictures of your MC group. Looks like you guys have fun when you ride.